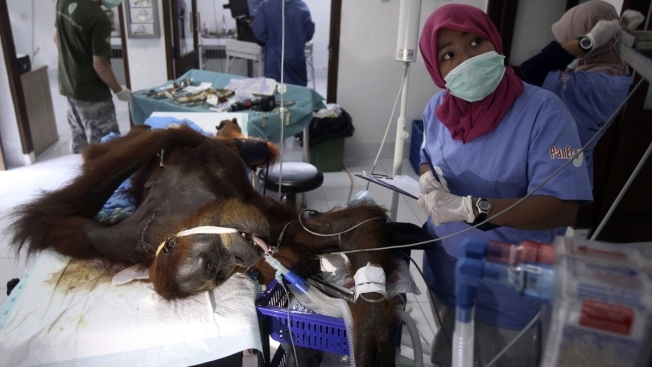 In this photo taken on Sunday, March 17, 2019, veterinarians and volunteers of Sumatra Orangutan Conservation Programme (SOCP) tend to a female orangutan they named 'Hope' during a surgery for infections in some parts of the body and to fix broken bones, at SOCP facility in Sibolangit, North Sumatra, Indonesia. A veterinarian says the endangered orangutan that had a young baby has gone blind after being shot at least 74 times, including six in the eyes, with air gun. An orangutan mother has been blinded after being shot with at least 74 air gun pellets on Indonesia's Sumatra island, where threats to the endangered species have increased as the palm oil and paper industries shrink its jungle habitat.